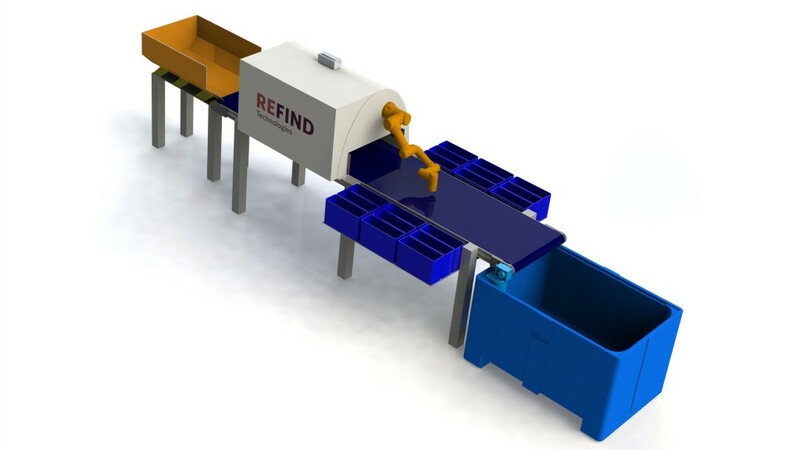 According to Refind, the new REFIND SORTER is inspired by natural vision, but with the speed and reliability of a digital computer the Refind Sorter can identify and sort a vast and highly customizable range of objects and materials after being presented with examples of them. The technology uses modern artificial neural networks to recognize where items belong, and can do this while collecting comprehensive statistics on the stream and the operations. The Refind Sorter can be used for many different types of objects and applications. Everything from pure image analysis to full scale automation of recognition and materials handling. Thanks to the general software technology and the modular equipment solutions - opportunities are vast. For example, the Refind Sorter technology can be used for sorting out hazardous objects from a mixed e-waste stream, for sorting out valuable material from a mixed shredded metal stream, and for registering an incoming stream of used products to a second-hand trader or for counting objects. This sorting technology is available in Canada and the US, and according to Refind, is especially suitable for e-waste sorting, either to sort out valuable materials (either for re-use, refurbishment or 'cherry-picking' recycling) or to sort hazardous objects from a mixed stream of products or semi-shredded products. For plastics and paper recycling, this technology is designed to use material sensor-based sorting, since material is often homogenous or in small enough pieces to be sorted into homogenous fractions. Refind says material collectors and ITADs employing the Refind Sorter can increase yield from current streams while the potential access to real-time price data provides new possibilities for incentive-based collection, while reuse and refurbishment companies will profit from better quality and less waste. The Refind Sorter can also be used for efficient pre-sorting of large volumes of phones, tablets, hard drives and other products in second hand trading and e-waste recycling. A range of options are available. The sorting criteria for the Refind Sorter are flexible. They can be static in nature, as in product model, species or color, to name a few, or dynamic, like the item's current online value or stock supply level. Using a digital sorting solution allows for fast and flexible changes to the identification unit and the sorting equipment. The knowledge will always be kept and the sorting system can be scaled up for increased capacity by "copy & paste", unlike the case for new human operators which would require training. Watch Below - see the range of solutions available from Refind.